The shallow, efficient optical design of the Para-Lite 1™ louver provides for maximum light output and excellent shielding. Designed with space saving in mind, it is both durable and cost effective. Manufactured using the latest molding and metalizing techniques, the Para-Lite 1 has been shown to be at least 20% more efficient than traditional nominal 1/2” x 1/2” parabolic louvers. Office environments, task areas, elevators, conference rooms, corridors, medical facilities,auditoriums, perimeter lighting, retail stores and banks. Please call 1.800.880.5483 for price and delivery. CUT – Cut to size Note: Cut to size – on Cut to size orders O.D. must be provided. To Order: Select description from each column and include “options” if applicable. Great care should be exercised when handling parabolic louvers, avoiding contact with oily and/or foreign substances. Always handle louver panels with clean white gloves – never use bare hands. Always install these louvers after the space has been completed and is ready for occupancy – never during construction! 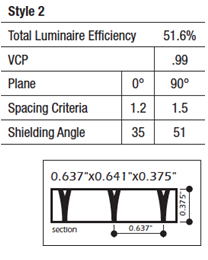 Lighting Fixtures – Panels will sometimes require additional cutting for proper installation. For color designation use B for black, W for white. For specular finish use SPS. Special Sizes – Special sizes are available, contact Diffuser Specialist. Specifications-Parabolic Louvers shall be Para-Lite 1, and shall be one piece injection molded of polystyrene with all parabolic surfaces prepared with a primary undercoat and a highly specular vacuum metalized finish. Cell dimensions shall be 5/8” x 5/8”x 7/16” and shall provide 35º shielding with a louver efficiency of not less than 51%.